When the local business owners in Beach City start to feel the economic pinch during the tourist off-season, Mayor Dewey and Buck come up with a solution: food trucks! This issue was centered more on Mayor Dewey and his son, Buck, rather than Steven and the Gems. I really liked that the story was more on the town itself; don’t get me wrong, I love Steven and the Gems, but I also like the towns folk and I want to see more of them too! In this story the town is trying to solve a problem of many beach towns during the off-season, drawing in customers. Buck comes up with the idea of bringing in food trucks on the weekends to help bring in more people for the local businesses. Things go off without a hitch…except the local businesses suffer. However, together Mayor Dewey and Buck find a way to both draw in people and help their local businesses, also highlighting the importance of local shops and how just bringing in new people won’t always help. The story was really simple and you see some sweet moments between Mayor Dewey and his son. While they’re not main or major characters, I thought it was still nice to see more of their relationship together. It was also nice to see that while yes, Dewey is a politician, but he also really cares about the city he watches over. I think that the artwork has improved a lot since the first issue. 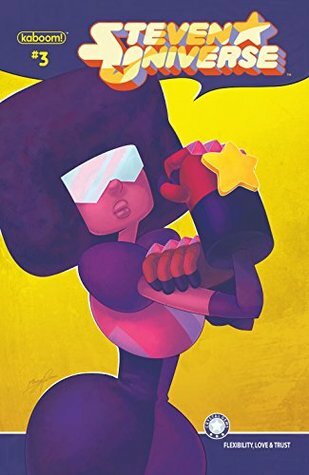 The first issue of this run had great art, don’t get me wrong, but it still didn’t feel quite like Steven Universe. However, I feel like the artist has really captured that in this volume while still having their own style. I also loved some of the sight gags in this issue, one that I was not expecting but won’t ruin for anyone else! Why do I have to wait so long between releases?!? Until next time!